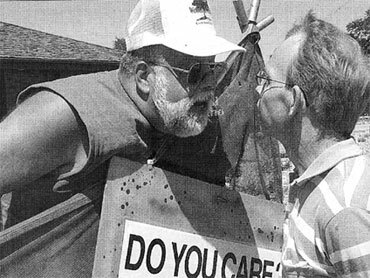 Photo: Anti-abortion activist Jim Pouillon, left, has a heated discussion with a Planned Parenthood employee in Owosso, Mich. in August 2002. OWOSSO, Mich. (CBS/AP) Jim Pouillon, an anti-abortion protester familiar to residents of a Michigan community was shot to death outside a high school in front of horrified students and parents, according to police. Owosso police chief Michael Compeau said Pouillon, 63, was outside the school with a sign when a man drove by and shot him Friday morning. Police have arrested a suspected gunman, but have decline to release his identity. The gunman allegedly told officers arresting him that he was involved in a second killing that day, authorities said. Officials found the body of Mike Fuoss, 61, in the office of his gravel production company. Sheriff George Braidwood said Fuoss and the gunman knew each other. Owosso Police Chief Michael Compeau said authorities did not know whether the suspect knew the anti-abortion activist, Pouillon, who was shot across the street from the school in the town about 70 miles northwest of Detroit. Police declined to release the gunman's identity and no other injuries were reported. No motive was given for the shootings, but Compeau said he believed Pouillon appeared to be a target. "I would speculate it was ... intended," Compeau said. "He was out protesting right across the street from the high school ... and there (were) multiple people around there and that person was targeted." Hours after the shootings, authorities working behind yellow crime tape near the school removed Pouillon's oxygen tank and the sign he held — it had a graphic image of an aborted fetus. Students said Pouillon was a fixture outside the high school and regularly held graphic signs. "I can see someone spitting on him or punching him, but shooting him is pretty stupid. It's not something you expect in Owosso," said 16-year-old Curtis Wisterman. After the shooting, all schools in the district were locked down, but opened up again after the suspect was arrested, said Julie Omer, business manager for Owosso Public Schools. "He was just a kind, gentle man who loved life and endeavored to save other people's lives," Newman said. Residents who live near the gravel pit company were also trying to come to grips with what happened. Fuoss was very business-oriented, but cordial, said 61-year-old Linda Strieff, a longtime neighbor who stood outside the gravel pit.